I have just returned from Premier Vision in Paris, a three day Fashion Fabric Fare and Fashion Forecasting and Fashion Trends for 2013 and 2014. I found it a very successful and enjoyable show, and I was very inspired by the new colours and fabrics for 2013 / 2104. At the moment, I am designing a lot full length dresses for the less conservative Mother of the Bride in some of these new and less conservative strong, bold colours in structured silks and wools. It is a slightly more glamorous look for the Mother of the Bride. I have sketched a dress style below, The Kate Dress, which is very popular, as it gives a a very flattering shihouette. 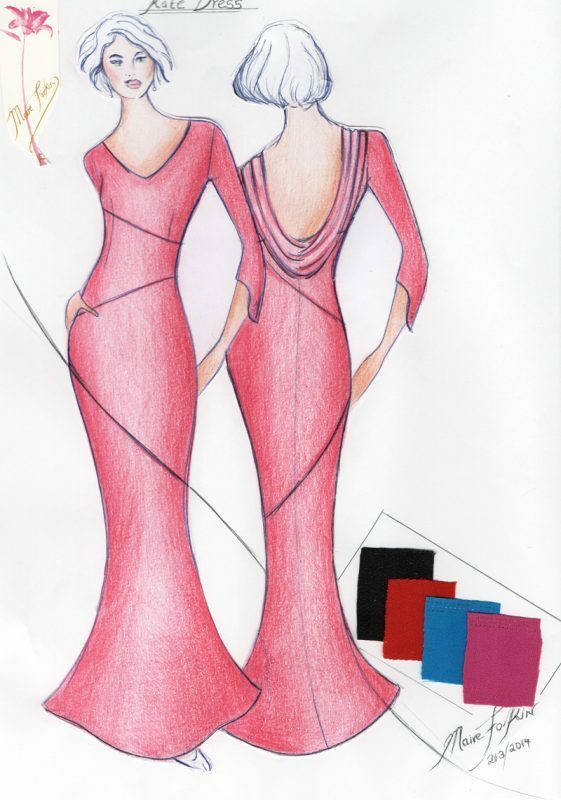 My clients have designs made to measure in styles and colours which to best flatter their figures and complection. Little flattering head pieces can be made in complimentary styles and colours. These styles are also available as Wedding Dresses in diffferent fabrics. If you like these styles, please ask me for further details. Also Ask Your Friends to “Like Me” on Facebook.